» Surgent CPA Review 2019: Free Trial and Huge $$$ Discount! Surgent CPA Review (formerly known as Surgent Kolar CPA Review) was founded by John “Jack” Surgent and Liz Kolar in 2013. Surgent CPA Review is an integrated and guided review course that presents video lectures, proprietary textbooks, study notes, practice questions, and practice exams in one online platform. You can take the self-study course in the comfort of your home (or office), at any time of the year, and at your own pace. Access is unlimited, and a free trial is available. The lectures are viewed online, either on a desktop or on portable devices including iPads, tablets, and Android devices. There are 350 videos available. If you read my book, you know I am a big fan of “active learning”. Traditional CPA review courses have long lectures that drag on for 3-4 hours. I personally don’t think this type of passive learning is effective. I am glad to know that Surgent CPA’s lectures are often 10-20 minutes, and the total number of lecture hours is fewer than most courses. This way, you can spend more time on active learning through practice questions. Surgent develops their study notes, together with the video lectures, in house. There are over 7,500 multiple choice questions and 400 task-based simulations to help you get familiar with how the actual exam works. These questions are presented in an adaptive learning software to help you focus on weaker areas. The online Study Planner calculates the required study time by entering the date of the exam and days of the week you plan to study. Students can contact Surgent by phone and email. The turn-around time is typically 24 hours or less. The course comes with a handy flashcard app. 12 sessions with a CPA Exam success coach (3 30-minute sessions per section), which have a $600 value. Jack is CEO of Surgent McCoy CPE, a major provider of tax and financial-planning seminars to CPAs in the U.S. He also manages a CPA firm specializing in taxation and financial planning for high-net-worth individuals and closely held businesses. Liz has been teaching CPA review in the U.S. for more than 20 years. She has experience in public accounting at Coopers & Lybrand and teaching full-time in several universities. Liz is not only an experienced teacher but a great one. She has won awards such as PICPA (Pennsylvania Institute of CPAs) Outstanding Educator of the Year. Jack has personally presented over 1,800 live seminars in the past 25 years and has been named Outstanding Discussion Leader by various professional organizations. Liz and Jack not only teach the materials but also go over 100 multiple choice questions and simulations in the lessons, which I find very helpful. The software creates a “reference report” that shows a list of recommended reading based on questions you have done wrong (i.e. your weaker areas). Students can rely on this report for more targeted review vs the traditional method where students are expected to read the book from cover to cover. If a student fails the CPA Exam after studying with Surgent, Surgent will refund the tuition to the course or provide continued access to the program until the student passes (please refer to the terms of conditions for details). I also like the free trial, because it shows the team is confident in their product. Some other providers have longer trial periods (14 days vs Surgent’s 3 days) but in my opinion, 3 days is enough time to make a decision. We are not able to confirm this pass rate, so do not expect to receive pass rates as high as this, as everyone’s scores and pass rates will vary. I have taken a good look at Surgent’s powerful adaptive learning technology, videos and the many features they offer. I like it a lot, but my CPA review course evaluation relies heavily on the experience of my readers. Surgent CPA is relatively new, and, understandably, I am still collecting feedback from readers. So far, I have received a few rave reviews on Surgent’s products, and that’s why I’ve decided to put them in my top 5 recommended list. Time will tell if Surgent can rank among the other established providers. Surgent doesn’t duplicate some of the things we love Wiley CPAexcel for, like the huge test bank and the myriad of features. And the lecturers aren’t as exciting or engaging as Roger CPA’s. But if adaptive technology is a must-have feature for you, you may be perfectly happy with this course! 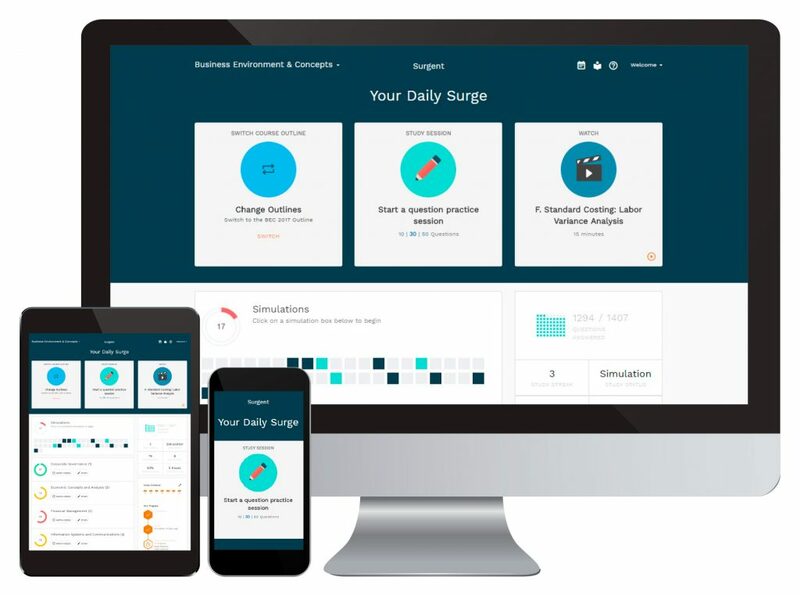 If you don’t mind the relatively new brand, Surgent has all the goodies — a great lecturer, adaptive learning, online tracking, a free trial, and a pass guarantee — in one nice package. Save $$$ for a limited time with an exclusive offer only available to I Pass the CPA Exam readers! Huge Surgent CPA Review advocate. I passed on the first time. Can’t say enough good things about their program and staff. Surgent is great. The software helps to cut down study time….. big time! I am also based from India and do not want the hard copies of the textbook. i wanted to know if I could get my course through the Gleim’s site directly or I have to go through the distributor Concorde? So surgent or roger? Whixh one wud u prefer? But in general, Roger is the most “celebrated” videos (as in most people pick Roger because of that). Surgent is slightly better in everything else in my own opinion. Both are on my recommended list. Hope it helps! I have done bachelor (2014) & masters(2016) in business management from UK.I have evaluated my certificates through IERF. My total credits are 136. Currently I am living in Bangladesh. Recently I have got married to an American citizen.I hope to be in US before 2018. 1. Is that OK if i buy the Rogers review course now and start studying ,so that I will be quite confident to take the CPA exam after I go to US? 2. As every year CPA books get updated,is it going to be worthy if I buy the course now? 3.How can I get the 14 more required credits to get the required 150 credits? I will highly appreciate your answers.Please do get back to me if I couldn’t explain myself clearly! Sorry I want to buy SURGENT not ROGERS. Sure Farhan. I think you are likely to be ok on the educational requirements, but there still could be missing a course or two depending which state board you choose. Typically, I suggest non-US candidates to have their application approved first before proceeding, just in case there is anything missing. Thank you for the reply.As you’re saying there will be major change in 2017-does that mean I shouldn’t buy any review course. I had a chat in SURGENT website,they said It won’t be a problem if I buy the review course now and sit for the exams on 2018.Because they update the system regularly. Please share with me your thoughts about that! I am wondering if I am going to be allowed in Michigan State to take the exams with 136 credits? I think so, but ultimately you need to fulfill 150 credit hours to get the license. There is no official proof between passing the exam and getting the license. I am looking a good study material. I am interested in getting Surgent CPA review courses. Do you think their martial are sufficient for testing in California as well? I am eligible for the CPA exams and will be graduate this month 2016. I am planning on taking all 4 parts before April 2017, which mean each part I may only have time frame from 10 to 14 days to prepare. This will also be my first time taking CPA exams. My question is I am not a native English speaker so I don’t mind if there is no video or audio lectures, I would prefer a deeper explanation for each section or lectures. I have full time job and family to take care. So far, Surgent and Wiley are my top picks. However, I wonder since I only have so little time to study, do you have any suggestion on either which part to take first or which program will fit better in my end? I see that some comments on Wiley is a bit confusing and does not go very details even though the lectures break down in smaller time frame to achieve. Hi Bi, sorry to reply late I missed your comment for some reason. Wiley and Surgent are quite similar, but I find that Surgent tries to improve upon what Wiley has been offering so in every aspect it seems to be just a little bit better or more user friendly. They have to do a better job with a lower price to get their reputation out, given they are a relatively new brand. I have to say 10 to 14 days for each part is a huge challenge… but I am glad you are trying your best. If it becomes impossible, I would focus on at least passing maybe 2 parts, preferably at least BEC because it is going to have the most changes. Stay strong and good luck to your exams! I have the payment coupon from NASBA with me and plan to appear for FAR exam first in early 2017. I want to purchase Surgent CPA Review and avail the 20 percent discount you mentioned on this page. Please guide me the process to get this discount. Secondly, since the syllabus will change so will it be wise to buy this course now or wait until syllabus changes and new study material is in market. Hello FH, thanks for your note. Glad that you are in good progress! You can click on the button (or link) right above. This will take you to the Surgent homepage. Then, select your course and once you are ready to pay, enter the “CPAPASS” where you are asked to enter the coupon code. It should immediately be showing the discounted price. If it doesn’t work just come back and let me know. I will check it for you. Hi Stephanie, I am 51 years old a Controller and have never sat for the CPA exam. If I took one of these prep course, would I stand a chance at all of passing the test? Hi Pete, you will certainly stand a chance — I have a couple of readers who took the exam and passed in their 70s! I really enjoy your website and find it very helpful, thanks for that. I’m planning to study for the CPA again, I used Becker previously and I find it very good but the lectures are boring and very long. So I decided to switch to another provider and I found your review on Surgent is great and decided to give it a try. However, I couldn’t find if Surgent has books or printable materials instead of books since I’m kind of the type of students who like studying from a book. Surgent has study notes for each lecture, is that good enough? Would these study notes be enough to study and be ready for the exam. Hi Ahmed, in my opinion, yes, because for this type of professional exams, you don’t need to keep reading and re-reading the books. It is more important to go directly to the practice questions and test yourself until the concepts sink in. Hope it helps! As long as the notes have everything I need to get ready for the exam, I think the notes will be enough. I’m reading about the different CPA review course and still I have few doubts which one it could be the best choice for me. but not sure if this course will 100% match my profile. My English is not the best, in international candidate, so i like to see videos (with english subtitles it is possible) and I dont like so long video lectures, I like interactive boards, multiple test choice examples, and short videos because of my schedule. I really enjoy your website and find it very helpful. I am a first taker of cpa and a busy mom with 2 little kids and tight budget. After reading your reviews on study materials, I lean towards Surgent. I just passed reg for the first attempt by sharing materials with my friend, but I feel I should get my own. Please advise. where can I find the check out option? I really like your website and very helpful for me! I m planing to start CPA but what should i do to get 150 credit i done with MCOM in india. Should i have to take any course ?